Dr. Amy Guo has been working with the National Rongxiang Xu foundation (RXXF) as its director of public relations since RXXF’s founding in 2015. While an ophthalmologist bytraining, after leaving academia, Dr. Guo has had extensive experience working in the medical, healthcare, and pharmaceutical industry, in both for-profit and non-profit organizations. Prior to joining NRXF, Dr. Guo worked with the Wu Jie Ping Medical Foundation in Beijing China as the director of international affairs. While at this post,in 2004, Dr. Guo was honored to be engaged as a health management expert by the Medical Industries Expert Committee of UNIDO ITPO-CHINA. 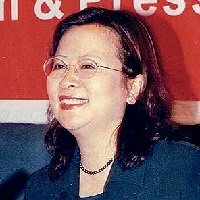 From 2002 to 2004, Dr. Guo served as the Vice-General Manager of DESANO Biopharmaceutical, where she was responsible for directing the marketing,PR, and FDA approval process of China’s first generation of generic drugs for treatment of HIV/AID. During this time, Dr. Guo was engaged with non-profit organization, including the United Nation and the Clinton Foundation,which were integral in the treatment and prevention efforts of HIV/AIDS in China. From 1997 to 2012, Dr. Guo was a founding board member of the Beijing Intech Eye Hospital – one of the first private hospitals in China. Dr. Amy Guo graduated from Harbin Medical School of China in 1977. She completed Master’s degree also at the Harbin Medical School in 1984, and practiced at the Institute of Ophthalmology, Beijing TongRen Eye Institute as an assistant professor. In 1986, Dr. Guo was admitted a Ph.D program to the Medical College of Ophthalmology at Jinan University in Guangzhou, China. In 1988, Dr. Guo was admitted into the joint doctoral students training program of China and United States, and came to the U.S. to study ocular immunology and drug research in University of Southern California, Doheny Eye Institute.